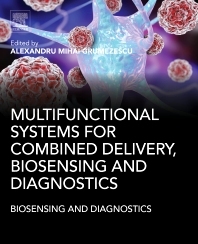 Multifunctional Systems for Combined Delivery, Biosensing, and Diagnostics explores how multifunctional nanocarriers are being used in combined delivery and diagnostics in contemporary medicine. Particular attention is given to efforts to i) reduce the side effects of therapeutic agents, ii) increase the pharmacological effect, and iii) improve aqueous solubility and chemical stability of different therapeutic agents. The chapters focus on applications of nanostructured materials and nanocarriers, highlighting how these can be used effectively in both diagnosis and delivery. This applied focus makes the book an important reference source for those wanting to learn more about how specific nanomaterials and nanotechnology systems can help to solve drug delivery and diagnostics problems. This book is a valuable resource for materials scientists, bioengineers, and medical researchers who are looking for an applications-oriented guide on how nanotechnology and nanomaterials can be used effectively throughout the medical treatment process, from diagnosis to treatment. 8. Nanoparticles for Anti-Cancer Drug Delivery "Targeting to Overcome Multiple Drug Resistance"